At a time of economic austerity, the UN Secretary-General is urging countries not to forget about the poor. 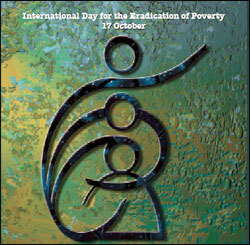 UN Secretary General Ban Ki-Moon issued the following message for the International Day for the Eradication of Poverty. Poverty is easy to denounce but difficult to combat. Those suffering from hunger, want and indignity need more than sympathetic words; they need concrete support. Rampant poverty, which has festered for far too long, is linked to social unrest and threats to peace and security. On this International Day, let us make an investment in our common future by helping to lift people out of poverty so that they, in turn, can help to transform our world. This message, as well as those form previous years, can be found on the UN website.